Rev. Milan and Kay Yerkovich tell husbands and wives how to connect to their spouses. Milan, an admitted task-oriented avoider, and Kay, an avowed vacillator, tell how they learned to understand and connect with one another to form a lasting bond. They share how their "soul word list" helped them learn to describe what they were feeling and to say the things they needed to say. Bob: Do you understand your emotions enough that you’re able to put words to what it is you’re feeling? And beyond that, do you know yourself well enough that you know, when you’re in pain, “This is what would help.” Here’s Kay Yerkovich. Kay: When you share your feelings / if you can link it to a need so that your spouse has a specific way of meeting that need—something doable and concrete—“I feel sad…” or “I feel lonely, because we haven’t had any time to connect. I would really love to go out to dinner tomorrow night. I’ll even get the babysitter, so we can really have a talk and connect.” That’s making a request, not a complaint. Many times, we just make a complaint without really making a request. Bob: This is FamilyLife Today for Wednesday, September 26th. Our host is Dennis Rainey, and I'm Bob Lepine. Part of how we love one another in marriage is by understanding each other’s feelings and knowing how we can help. We’ll explore that more today. Stay with us. And welcome to FamilyLife Today. Thanks for joining us. So, I think the question for us, at this point this week, is to figure out how we help couples who aren’t connecting as they ought to connect—how we help them get from where they are to where God wants them to be; right? Dennis: We want to help you know how to bond to your spouse. Bob: This is what we talk about—we call it “oneness”—at the Weekend to Remember® marriage getaway. That’s what God designed marriage for—is that kind of bonding together. With us is Milan and Kay Yerkovich—welcome back to FamilyLife Today. Milan: Thank you so much. Dennis: —glad you wrote this book. It’s called How We Love. Basically, what they’ve done is—they have let us into a little heart surgery that God did in their marriage, some 15 years into their journey, and have shared with us, in this book, some profound understanding of how we do love each other and how we miss each other in conflict. Bob: Yes; and this is tied to how we form attachments, what we experienced as kids, and what we then bring into marriage—kind of these patterns we learned, growing up, and then how those patterns intersect or how they clash. If a couple’s coming into your office—just give us an example of a couple, who might have different patterns, come into your office—and can you role-play for us what it would look like if these different patterns? Can you do that? Dennis: —and call a technical foul! Bob: So, what were you modeling for us? You’re home-fixated on something functional. Milan: —a task. I’m the Avoider, who is, functionally, about task mastery and accomplishments of things. It’s about non-relational connection. Kay: I’m the Vacillator—I live for connection. I’ve been thinking, all day, about it—I’ve been anticipating how he’s going to respond to this surprise. I have an ideal picture in my head of what it should look like; and even though I know he always goes to the mail, I think this day it’s going to be different. When I realize it isn’t, I protest—I get mad, and I retreat. Bob: If a couple has—maybe this is their dance / maybe their dance is something different than this—but they find themselves stepping on one another’s toes pretty regularly as they do their marriage dance—and they say, “Okay; we want to get out of this pattern,”—what’s step number one for them? Kay: There are two steps. Number one is: “Own your own attachment style. Own the brokenness in you; own the injury. There’s a whole workbook that goes with How We Love, and there’s a separate chapter for each of the broken styles: for the Avoider, the Pleaser, the Vacillator, the Controller, and the Victim. Bob: You have to know what your style is to own it. Kay: And the growth goals are different. Kay: My growth goal, as an Avoider, was to start to know what I felt, to tell him, and to come close. His was to learn to separate and be okay without constant proximity. Your growth goals may be very different. And then the second big thing is the comfort circle. Kay: Maybe we could describe that. Dennis: Yes; the comfort circle is how we bond with each other. You have a four-step process that really is very practical. This first one—you’ve already hinted at it—is self-awareness. It’s being aware of how you relate to another person. “What am I feeling right now?” I didn’t know what I was feeling, except afraid. I had to look through that “Soul Word List” and come up with something that I would then share with Kay. I had to be strong enough and brave enough to do the second step, which was to speak the truth in love. Bob: Okay; before you jump to that—because Dennis dog-eared this “Soul Word List.” You love this list; right? Dennis: I do, because I think most of us can’t name what we’re feeling. Dennis: These words, I think, help put key words to what we’re feeling. For instance, “anxious”—unpack the word, “anxious.” What does that mean? —so they can tell themselves, “I’m okay.” They’re very dependent upon other people to help them. Milan: Well, “traumatized” means I was scared; I was hurt by something. It could be a small “t”—a series of small traumas that are chronic—or it could be a big “T”, where I was in an automobile accident; or I was abused by someone, sexually, or emotionally, or physically. I have to be able to define those; but for most of us, our brain tends to shut these things off. We don’t always want to—nor do we know how to—identify them. Bob: There are probably 20 words on the list: despised, invisible, disappointed, ashamed, confused, betrayed, sad. Bob: Yes; so if you look at this list, and somebody says to you: “Okay; I look at this. So, most of the time—happy, loving, confident, peaceful—those are my words. “That’s how most of my life is.” I’m going, “That’s how I feel most of the time,”—so what’s going on? Kay: Well, there are two possibilities for that. You’ve really grown, and you’re in a season where there’s not a lot of stress. Kay: More likely, I’m going to say, you probably don’t know how to name your feelings. You probably live with a level of denial and just lack of awareness; because we live in a broken world; and really, every day has stress—it can be a little bit; it can be a lot. Being a mom is stressful; being a spouse is stressful. If we just say we’re always happy and good, we’re probably not being very real with the world we live in. Kay: Well, we live by that exact thought—that faith meant I didn’t have bad feelings. And then, when I look at the Bible, I look at God describe His feelings—He’s jealous; He’s angry; He’s joyful. Bob: The Psalms is God’s hymn book, and we’re singing all these emotion words back to Him; right? Kay: I think it’s really a misnomer to think that, if we have faith, we don’t have negative emotions. Faith means I will obey and keep moving forward in my growth; it doesn’t mean I won’t have emotions in that process. Milan: That means that there’s a percentage where you’re not mostly something—you’re less-ly something. Bob: Well, so I’m sad—I get sad sometimes. Milan: That would be sweet, because I know you’re an ice cream guy. You may think ice cream’s going to take that sadness away—or a hug, or to sit down and pray with you, or to empathize with the grief that you’re feeling. Bob: After self-awareness, now, we have to learn how to communicate—is that step two? Milan: Right. Ephesians 4 says, “Speak the truth each one of you with his neighbor, for are members of one another.” As a fearful person, I was too afraid to speak the truth. I was a liar. She’d say, “How are you?” and I’d go, “I’m great”; you know? Well, that wasn’t true. I had to learn to be honest with you and risk the rejection or the backlash that might come from you if I told you the truth. Bob: Did backlash come some? Kay: Oh, sure. We didn’t have an honest conversation till the 15-year mark. That’s true of Avoider/Pleaser pairs, because neither one of them want to do messy emotions. Bob: Did you feel like your relationship was threatened? Kay: We had really made a commitment to never divorce, so not in that way. But I felt that our relationship was very tumultuous—and you know, “Are we going to continue this growth journey, or are we going to bail out and just live like we’ve been living?”—so there was that there. There is a very important part of a marriage relationship to do what you guys are talking about—speak the truth in love. She didn’t hammer me with that. Dennis: She spoke it in love. —so when we’re saying, “I feel sad, because I feel distant from you,” now, all of a sudden we’re saying, “You’re messing up,”—we’re calling you out in the relationship. That’s when it can get threatening, especially for a Pleaser, who is just wanting you to be happy all the time; right? Milan: Yes; that’s what the Pleaser wants, but you said that very nicely: “I’m sad, because I feel distant.” That’s an honest, vulnerable, transparent request. You know, the Bible says, “You have not because you ask not.” Isn’t it interesting that God tells us we’re supposed to ask Him?—and yet, He knows us already—that’s sort of an oxymoron right there. Milan: My spouse, who doesn’t know me, how much more do I have to ask for that which I desire?—so: “I feel distant. I would love to spend more time together,” or “You seem like you’re worrying, Dennis. What are you worrying about? Do you want to talk about it?” is a way we can draw people out. The Proverbs also say that it is a wise person who can reach down in and draw out a person’s soul / draw out what’s going on inside with them. It’s an attempt to engage. Bob: So you know, though, Kay, that somebody will say, “I’m sad, because I feel distant from you,” and the other person says: “So it’s my fault again; right? I’m always the one who is messing things up and making you feel sad.” All of a sudden, the communication goes sideways; and this whole thing short-circuits. Kay: Right. I think, when you share your feelings—if you can link it to a need so that your spouse has a specific way of meeting that need—something doable and concrete—“I feel sad…” or “I feel lonely, because we haven’t had any time to connect. I would really love to go out to dinner tomorrow night. I’ll even get the babysitter, so we can really have a talk and connect.” That’s making a request, not a complaint. Many times, we just make a complaint without really making a request. Bob: And then where do we go from there? Milan: —which means I’m going to learn to listen to you. James 1:19 says, “Be quick to hear”—that means get stuff in your ears as quickly as you can / quick to hear—“slow to speak, and slow to anger.” Now, we do those backwards, so we need to learn to do that. I would ask you, then, if you told me, “I’m sad because there’s distance,” I would say, “And what else do you feel?” And then I’d ask you if you ever felt that way before you met me and “What does distance do to you?” I would want to, then, get to know, through exploration, a deeper understanding of what is behind the protest or the request and the feelings associated with it. Kay: Yes; and I think you have to ask yourself, “What did questions mean when you were growing up?”—because some parents ask very thoughtful questions—they notice a mood; and they inquire about that mood, or they inquire about your wellbeing, or what’s going on inside. Or maybe your parent’s like a lawyer and going in for the kill—so the questions are backing you into a corner. We find couples respond to questions, even, from their own training and background; but we had no ability to really explore through questions—that was a learned skill for us. Dennis: One of the things that you do in your book is—you talk about asking these questions and affirming the answer as your spouse gives an answer to it. You’re not trying to create guilt, or shame, or find them creating a sin or a foul, or something like that. Bob: You’re not trying to fix them in the process; right. Let’s go on to the fourth step in here. I’m not trying to get away from my situation; Barbara’s not done with me yet. [Laughter] And neither is God, by the way. Bob: Self-awareness, then communication, and then there’s understanding/empathy—that’s going on—that’s the third thing; right? She may say to me: “I need comfort,” “I need to problem-solve,” “I need to analyze what’s going on here,” “I just needed to vent. Thanks for listening to me.” I let her tell me what the solution is she needs. Kay: And I think when you answer that question, you have to be very honest about what you can and can’t do. The one who’s speaking—you can’t say, “Well, I want you to be a better husband,”—that’s very vague: “Well, what does that mean exactly?” But to say, “If you would just pray with me at night, when we go to bed, that would mean a lot to me,”—that’s a very concrete, observable thing that someone can do. Dennis: —because it may take years. All of a sudden, now, we’re disappointed. We’re never going to have that conversation with anybody again. Bob: —and the opportunity for somebody to wound you deeply is there every time you go into this. I mean, she was one of the worst listeners I think I ever worked with. I, literally, just taught her how to listen without disagreeing / without telling the person they’re wrong; how to be curious / how to just draw someone out. We worked very hard until she became quite good at it. I just said: “That is wonderful! You modeled something that he probably never has done before.” She showed genuine interest in him without disagreeing with everything. So, just learning to explore and be curious can be a huge plus in a marriage. Milan: —instead of starting there. This client that Kay trained was to start with just listening! And boy, did that change their relationship. Come to God and say, “God, I’d really like some help in learning how to listen to my husband/to my wife.” Ask God to begin to teach you how to become a better listener. Maybe you know somebody who’s really a good listener. Pick their brain and ask them for the best tips they can give you on listening. I’ll guarantee you—the person who’s a good listener knows how, also, to ask a good question, too, that gets at the heart of the matter. Dennis: If you’re looking for some practical help, too, the Yerkovich’s book, How We Love, is a great addition to your library. There’s lots in here that you’ll be able to benefit from in your marriage relationship. I just want to thank you, Milan and Kay, for all your work over the years; and thanks, too, for sticking around, here, at FamilyLife® and equipping our staff with a marriage retreat tonight. Milan: You are so welcome. Kay: We’re looking forward to that. Thank you! Bob: And again, I hope our listeners will go online and take the assessment that you’ve created from the How We Love book. This is a free assessment that will help you understand what your love style is—how you relate to others and where there may be points of conflict. Again, the assessment’s free. You can go, online, at FamilyLifeToday.com to take it. You know, this subject of how we love, not just in marriage, but how we love one another, is at the heart of the gospel. It’s at the heart of all we do, here, at FamilyLife. Our mission is to effectively develop godly marriages and families. We believe that it’s through godly marriages and families that God will change the world; and we believe, at the heart of all of that, is the gospel. Everything we do, here, at FamilyLife is centered on our understanding of what God has done for us in Christ. Our friend, Bryan Loritts, has recently written a book, called The Cross-Shaped Gospel, that we think is a great book for couples and families to read together to understand what’s at the core of the gospel message to understand how this impacts every aspect of our lives. We’d love to send you a copy of Bryan’s book, The Cross-Shaped Gospel. We’re making it available this month when you help support the ministry of FamilyLife Today with a donation. Box 7111, Little Rock, AR; and our zip code is 72223. Now, tomorrow, we’re going to talk about your teens and their devices. I’m talking about the devices they carry with them in their pockets—the devices they seem to be on all the time. We’re going to talk about how we wisely manage their use of those devices, as parents. If you can tune in, be with us for that. Rev. Milan Yerkovich, M.A. Milan, ordained minister and pastoral counselor, has devoted himself to working with families and couples for over thirty years. Milan holds his masters degree in Biblical Studies and his California teaching credential. He loves teaching the Bible, and lecturing on relational theology. 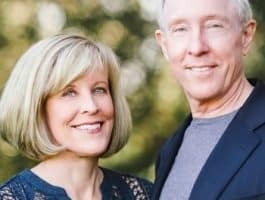 He was a pastor for thirteen years, and previously worked as a pastoral counselor with the Center for Individual and Family Therapy.In 2003 he became the full-time director of Relationship180, a non-profit organization devoted to counseling individuals and families toward healthy relationships. He also works as a radio co-host at New Life Ministries with Steven Arterburn, a nationwide counseling talkshow. In his spare time, Milan enjoys martial arts, biking and playing the guitar. Kay Yerkovich, M.S., M.F.T. Kay is a licensed Marriage and Family Therapist. She enjoyed her role as a stay at home mom for many years, and completed her master’s degree in Marriage and Family Counseling in 1993. Her specialty is treating couples using attachment theory as the foundation of her work. She is a popular speaker and lecturer in the areas of parenting and marriage relationships, and she supervises and trains other therapists. Kay also enjoys participating in a prison ministry.Kay renews herself through ceramics, watercolor painting and designing jewelry. She is happiest sitting on the beach with a good book and a cup of Starbucks coffee.